Angel Trains, ESG Rail and Stratasys tackle obsolescence in the rail industry with UK’s first 3D printing manufacturing solution. (Derby, 10. December 2018) Angel Trains, one of Britain’s leading train leasing companies, has collaborated with engineering consultancy DB ESG, and 3D printing technology provider Stratasys, to produce four fully approved interior components using 3D printing, also known as Additive Manufacturing. The aim of this collaboration is to leverage additive manufacturing to help address the issue of obsolete parts, reduce whole life rolling stock costs and enable vehicles to remain in passenger service for longer. This innovation also has the added potential to lower costs for train operating companies, as they can produce low run parts as needed, rather than mass manufacturing vast quantities. All parts have been designed for additive manufacturing and 3D printed using Stratasys’ Fused Deposition Modelling (FDM) technology. 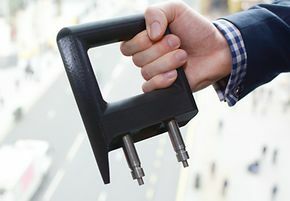 In addition, the components have been structurally assessed by DB ESG for manufacturing using Stratasys 3D printed tooling and the company’s advanced, rail-certified thermoplastic materials. The components will soon commence in-service passenger trials, which are expected to last until the summer of 2019. Traditionally, standard thermoplastics have been used, but these have poor mechanical properties and fire performance, and are therefore unsuitable for rolling stock applications. New, high-performance materials, including Stratasys Antero 800 NA, a PEKK-based thermoplastic, have now been tested to demonstrate they are capable of achieving compliance to the Rail Standard EN45545-2. DB ESG is the route to market for DB’s technology expertise. As part of the DB Group, DB ESG provides innovative, value-led strategic advice, technical consultancy and technology integration. Based in Derby, home to the largest cluster of railway companies in the world, DB ESG is a leading rolling stock consultancy and provides services to many of the UK’s train operators, manufacturers, owners and maintainers. Angel Trains is one of Britain’s leading train leasing companies and has been an owner and lessor of rolling stock since 1994. The company leases to 18 franchised operators and two open access operators in the UK. Angel Trains is passionate about financing and delivering high quality, modern assets to its customers and is committed to working with the Government, the Rail Delivery Group ("RDG") and other stakeholders to provide innovative funding solutions to modernise and improve the UK's train fleet. Angel Trains has invested £5.0 billion in new rolling stock and refurbishment programmes since 1994 and is one of the largest private investors in the industry.